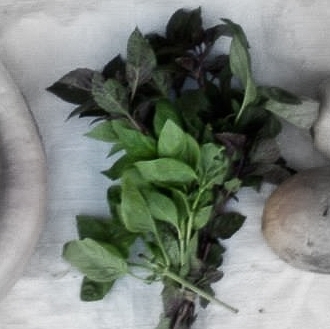 Our shares include a variety of fresh herbs. For help identifying or using them, browse the images and descriptions below. Cilantro is an herb with a fresh, grassy green flavor. It works well stirred into salsas, sprinkled atop soups, whirred into salad dressings, or spread on tacos. A famous addition to pickles, this herb serves many other dishes quite well. It graces Greek recipes and adds a fresh bite to mellow foods. Try serving it with blanched, buttered carrots or use in this dill kohlrabi pie. We grow both curly (pictured here) and Italian parsley. Parsley is a great addition to meatballs, white beans, and salsa verde. Use in any recipe that needs a bit of freshness or a pop of green color. Sage is a grey-green herb has a strong, woodsy flavor. It adds savory depth to foods and works well with meats, gravies, beans, and mushrooms. Sage also works well with sweet winter squash. For a simple side, try sauteing mushrooms, garlic, shallots, and a sprinkle of sage. This spear-shaped herb has a sharp, lemony flavor, making it a great local alternative to citrus in salads, sandwiches, and garnishes. It's also very high in Vitamins A and C. Try it in creamy tuna salad or stir it into Greek yogurt for a sauce for meats, vegetables, or lentils.